Green Bean Casserole is a colorful connoisseur dish of French Cut green beans, white shoe peg corn, pimentos, mushrooms, cream of mushroom soup and grated cheddar cheese. 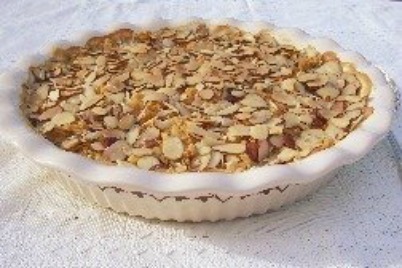 It is topped with buttered Ritz cracker crumbs and sliced or slivered almonds. I believe the second recipe is the original Classic Campbell's Soup Recipe. My twin sister gave it to me in the 1960s when she got it from the label of a can of Campbell's Cream of Celery Soup. Layer ingredients in bottom of a 1 1/2 quart casserole dish in the order listed. Mix together cracker crumbs and butter. Sprinkle almonds on top of crackers. Bake in a preheated oven 350F. for about 45 minutes until top is golden brown. * Cream of chicken or cream of celery soup may be substituted. Stir together mushroom soup, milk, green bean, half of onion rings, and cheese in a 2 quart casserole dish. Bake in a preheated 350F. oven for 25 minutes. Top with rest of onions and bake another 5 minutes or so until top is golden brown. A Chemist and nephew of Joseph Canpbell who ran the Joseph Campbell Preserve Co. came up with the idea of condensing soups in 1900. Dr. John Thomas Dorrance loved soups. However, they were not popular in America at that time. Dorrance thought that if he made the soups with less water (condensing them) for less shipping costs and packed them in smaller cans the housewife would buy them. All she had to do to feed her family was add water. In 1914 the Campbell Co started promoting it's soups as a recipe ingredient. That caught on, too. In 1934 the company started selling Cream of Mushroom soups. Source: The Century in Food, Americas Fads and Favorites by Beverly Bundy, 2002 1st edition, COLLECTORS PRESS, Portland, OR. In 1955 Dorcas Reilly of the Campbell Co. developed the Classic Green Bean Casserole for the holidays. In 2002 she presented the original recipe card to the National Inventors Hall of Fame, Akron, Ohio.